Kid friendliness: two small tables in the area, adjacent to food court seating. lots of kid friendly options for soups, fruit salads and noodles. Bringing the Japanese styled deli salads to the Eslite food court, Salad King offers appetizer sized and combination boxes (NT$50-140) for someone looking for something cooler for the summer. I can't quite remember what was here in this spot before Salad King (was it hot dogs? ), but it'll be interesting to see how long they can stick around. It does stand out with its clean deli style counter, but will Taipei stomaches want to eat salads? At first glance, their four square combination boxes (NT$120) look quite similar to the Dean and Deluca with the option to add a soup for NT$20. Here choices are preset for you, unlike your ability to choose your own hot or cold foods at Dean and Deluca. In their mini brochure, there are 4 preset boxes- (A) has fruit salad, smoked salmon, a mini shrimp salad and shrimp over noodles; (B) offers what looks like shrimp over salad, pasta, and I can't quite figure out the other two. I ended up getting (C) which has cold boiled pork slices on a pile of onions, soba noodles, caesar salad and shrimp over an egg potato salad. (D) is a vegetarian option with fruit salad, vegetable salad, rice noodles and some soy thing. I wanted to love my (C) set, but I didn't. The pork was chilled, so was not tender. It was cold and bland despite the drizzling of some sort of soy sauce. The caesar salad had bits of bacon and parmasean cheese and was not bad. The mushroom soba was also bland. Egg and potato salad was not bad, but I wished the shrimp didn't have a head on it. I also added the soup option and the soup of the day was a tomato soup. While it was a puree, it tasted creamy and rich, tasting maybe like it was made with chicken broth? I almost wanted a grilled cheese sandwich to go with it. 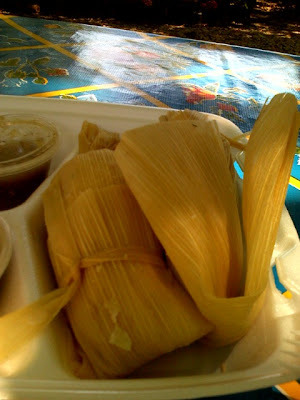 While it was good with the flavors and texture, it was quite heavy and I couldn't finish it. We also ordered an a la carte shrimp tomato thing (No. 15) for NT$70, which was had a shrimp on a bed of onions over tuna salad stuffed in a tomato. It sounds like a lot going on in one dish, but the flavors actually all went together and it might make a good snack. While they do offer various types of mixed salads, fruit salad, and other cold options, it's all very Asian style, except for the caesar salad. In my dream world, Salad King would be a bit more California inspired, offering cobb, chinese chicken salad or bbq chopped salad, but there's nothing like that in sight. If I tried it again, I would probably order the dishes I liked individually as not to get stuck with dud dishes in the combination box. Kid friendliness: no high chairs spotted and crowded space during busy lunch hour. If you've never really heard of knife cut noodles (or dao xiao mien), then you're in for a treat. I'd heard of fresh noodles, rolled and cut by hand, but never really eaten the kind that is slivered off a block of dough by a flat piece of metal right before it comes to your table. The knife cut method is famous from Shan Xi, a part of China where they love noodles. But everyone loves noodles right? Here you can choose dark beef noodle soup or the lighter tomato-infused clear broth, you can even get the beef noodle soup with tomatoes, which is what our friend recommended. She had been coming here since she was a kid, so it was evident that it was a neighborhood favorite as the small restaurant was packed with locals. The menu is the kind that you check off the boxes, only in Chinese, so don't expect pictures. But if you don't read Chinese and still want to try it out, you can just point to a dish that looks good at the table next to yours. Everything on the menu is very very affordable at under NT$150. I found the soy sauce beef broth to be a wee bit salty, but I still drank half of the bowl. The noodles are chewy (very QQ) and slippery, piled in the bowl in uneven thicker and shorter pieces than you'd find from a cut noodles place. It also comes with a large spoonful of the pickled vegetables that I like and plenty of beef pieces. You can also grab the cold appetizers such as tofu and thousand year old egg, cucumbers or green beans. There is also green onion pancakes made in the front, though I found that it was too thick and doughy for my liking. No matter- you are here for the beef noodle soup! Although I think I remember people at other tables eating rice and other dishes, everyone at our table had noodle soup (NT$90). While I was trying to find the address for this place (before getting it from my friend), I found that actually there are quite a few Dao Xiao Mien shops, and also some with the same exact name. So maybe they are all worth a try, if you see a sign like this near you. But if you want a sure thing, I strongly recommend that you head over to this Shan Xi Dao Xiao Mien shop. I think it's a little unfair that these places have not opened up shop in Taipei. Plus I didn't get a chance to eat at any of these places, only shop. While we were taken to some really great local eats, I have no idea where any of them were since they didn't have signs, were off in little alleys and didn't have any business cards to grab on the way out. I know, completely random, but I lost my camera last weekend and am too devasted to write anything meaningful. I have been taking a few pictures with my camera phone, but as you know, it's just not the same. Also, I LOST MY CAMERA! Argh. I guess it's an excuse to take a look at the Nikon D40 I've been hearing about or just replacing my Canon. BOO HOO. After visiting China, I've come to realize that maybe I'm not such a good tourist. I've become comfortable with Taipei so I know how things work even though I didn't grow up there- where my favorite places to eat are or at least what the different areas of Taipei are , how to tell if your cabbie is crazy or not, what the subway stops look like and generally where they are, where the major malls are, how to convert NT to US$ without doing too much math and if I don't know where to look online! But in China, I'm confused all over again. The local dialects are a lot more work to comprehend, trying to convert 7RMB to 1US$ is a lot harder than converting NT$s, I have no idea where public transportation is or what restaurant is good or not, and even the rumored American places like Krispy Kreme, I have no idea where to find them. Sometimes I don't even get to look at the menu, since someone else is usually ordering or has already ordered. I'm sure with time comes familiarity, but life is easier when you have someone who knows where they are going help you out. So my apologies for not sharing any dazzling photos or juicy descriptions of the variations of stir-fried river shrimp with vinegar, crackling skins of beijing duck, or sticky sweet braised pork and bean curds "red braised" in a large red ceramic pot that we seemed to be eating at every restaurant. Decent enough chain restaurant of Japanese food with a wide variety of things on the menu including sashimi, yakitori, noodles, hot pot, fried foods, and even stone bowl bim bim bap (NT$180-220) with the most expensive thing on the menu at NT$480 (the combo sashimi platter). The menu has Chinese and Japanese and pictures for everything, though no English. Service can be slow since they can get very busy though I spotted this service bell, though we didn't use it. Moderately priced, Watami is a popular choice for business lunches and large groups and the decor is modern infused with lots of red. The Neo 19 location (next to Chili's, at the old Spoon Thai food location) is more noisy and open than the more ambient Dun Hua basement location which has the dim lighting and bamboo divider curtains that grant a bit more aura of privacy. I doubt that anyone will ever say that they had the best Japanese food ever here, but they have enough things on the menu to suit almost everyone with a wait during weekends and their rush dining hours to show for it. Personally, I like their cold ramen noodles (NT$160) bathed in a vinegary sauce and found the broth in their big bowl of soupy ramen (NT$160) was even pretty tasty. I also like the option of ordering the yakitori, though it was a bit on the salty side at the Neo 19 location at my last visit. The bamboo wrapped in beef and mixed combo (NT$250) with six skewers. I also liked the mixed mushroom appetizer (NT$80), but found the fried lotus chips too salty (NT$100). While they don't have as many desserts as the neighboring Azabu Sabo, they do have a lot of different colorful drinks, mostly of the Calpis variety. I guess all in all, it's like eating a Japanese version of TGIF, offering fast and relatable foods for the business casual lunch or family budget and atmopshere. my first trip to Shanghai! I'll be visiting Shanghai for the first time next week! So I wanted to ask if any of you out there can recommend any good places to eat or good Shanghai food blogs. Much appreciated!!!! website: mindong.com.tw Chinese and Korean only. English section not active. Kid friendliness: no high chairs and be careful with lots of bbq beef grills on the table. Looking over my pictures, they really don't do justice to the discovery of this authentic and delicious Korean restaurant which is just a hop, skip and alley away from Sogo on Zhong Xiao East Road. Recommended by some good friends (and first I'd ever heard of it, not having seen anything online about it before), Min Dong lived up to the flavors and offered a range of foods I had eaten in Korea. The menu has pictures of everything (as well as English of the Korean names, Chinese) so that you can decide if you want to order off the menu, grill or hot pot. It's also a nice enough restaurant that you can bring guests or linger all over food and beer all night. You might notice when you first come in, the wall of photos of local celebrity customers as well as more than a few trendily dressed customers sitting at the tables. The seating is crowded, but not tight, but when it's crowded, everyone's conversations overlap over each other, so that it might be hard to hear the conversation at your own table. From the mini dishes of pan chan, thin slices of meat or seafood to grill and wrap in lettuce, bim bim bap, seafood pancake, cold chewy noodles, spicy tofu soup and bulgobi, it's best to bring more people so you can share and try more things. Everything usually arrives fairly quickly to the table in waves, so if you order a lot, a table for 6 can accomodate 1 grill and 1 hotpot or 2 grills. The seafood pancake (NT$250) is huge, served steaming hot and cut in 12 bitesize crispy thick pieces. It is so good that I want to eat more than my allotted pieces, but I know that I won't be able to eat anything else if I do. Those of you that read regularly now that I LOVE LOVE LOVE the icy vinegary and sweet naeng myun that I ate in Pusan and have been trying to find elsewhere ever since. I was able to find a decent bowl in Yong He, but that takes a lot more manuevering to get out to that area for me. So instead, until Min Dong adds it to their menu, I will eat the naeng myun mixed with hot sauce and vegetables. There are two spicy cold noodles on the menu, so be sure to get No. 12 which is the chewy bim bim naeng myun (NT$200) that is more spicy than sweet with a few ice cubes hanging out. You can also get spicy tofu soup in a bowl or a whole guo that they bring out pre-made to simmer on your table. The large tofu soup has tofu, golden and shitake mushrooms, assorted seafood, and even slippery udon that is hard to scoop out with the ladle. Even though we asked for hsiao la or low spiciness, it was still very spicy for me. So.. what to grill? I would recommend the ala carte meats over the beef platter (NT$800).. personally I really liked the beef tongue and the kalbi beef which is served boneless and sliced. We were lucky to have a server who helped expertly grill it and not overcook the beef, using the tongs to quickly flip over the meat and fold it over on the edges of the grill and serve it when it was done. As I learned after dining in Korea, it's customary to wrap the grilled meat in lettuce with your choice of sauce. The scallops were buttery and cooked in the small tin bowl. Also, when we added the bulgobi, we weren't sure how to cook the seasoned beef on top of the moat of vegetables and soup. Rather than putting it on the grill, they will bring out a whole low dome shaped hot pot to place next to the grill. After the hostess told us to just put it in the soup and another waiter just unhelpfully told us to cook it, we waved over our favorite waiter, who not only rescued the beef from the soup ("drier is better" he suggested), he also brought over little bowls and soy sauce and garlic to dip it in. It's amazing the difference that good service makes- it's those little touches that make you come back, or not. If I wasn't so full, I would have scooped up the vermicelli and tofu and mushrooms bathing on the sides to eat. But I had to save room for the free ice cream! The restaurant offers free self scoop ice cream in a little freezer in the back usually with 4-6 flavors offered. I've now been to Min Dong twice and would strongly recommend that you make a reservation a day ahead or in advance that day if you want to be seated sooner than later. Its forty or so seats and private rooms were packed to capacity both times and the second time, we still waited about 20 minutes because we had made our reservation only a few hours beforehand, along with about 10 other people waiting for a table. Min Dong is the kind of place you want to go with a group of friends to enjoy the good food, but also that way the more people you have, the more variety you can eat. Hi everyone! I can't believe it's been so long since I last posted... I'm back in Taipei after a short trip to the states. Everytime I go to LA, I tell myself that it means time to write up and post all the backlog posts that I have to work on, but the opposite is true- I'm soo busy that I barely have time to read other people's blogs much less work on my own. But I did take a few pictures to show and tell. WARNING TO MY TAIPEI READERS- not in Taipei! So don't browse if you are hungry, since you will probably not be able to find something similar to satiate you in Taipei. (If you can, let me know!) 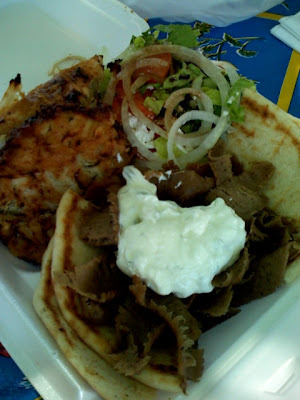 Ugh, I'm getting hungry just looking at the pictures again. I ate A LOT of American style breakfasts while I was in LA. One- the jetlag and short trip made sure that I was up early and hungry, so that was the perfect excuse to go have some waffles. 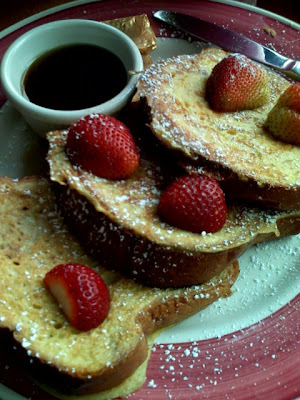 I had breakfast for the first time at Mimi's Cafe which was supersized and full of families. The food and service is what you'd expect from a chain restaurant- the muffin was cake-like, the breakfast burrito was lunch-like, I didn't taste any crab in the crab corn asparagus quiche, but we still left stuffed. On the other hand, I savored the fluffy and maple syrup drenched french toast and a few bites of a awesome huge goat cheese, sundried tomato, basil omelette at Novel Cafe. It's surprisingly usually not crowded, the service was friendly and everything (except the pancakes) tasted like it had just come out of the kitchen of someone who cared about how their food tasted and made with fresh ingredients. 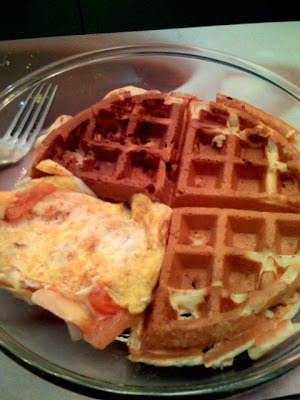 I revisited my love for what I think may be the near perfect waffle at Campanile on La Brea. I even had time to make my own waffle and eggs at home, though I didn't really care for the Archer Farms apple strudel mix I bought from Target. I had lunch with friends at the Westwood Farmer's Market which has moved since the last time I went. Sarah at the Delicious Life reminded me how much I wanted I wanted to go again. I bought some fresh flowers, basil and hummus, ate some tamales (get the blue corn over the regular corn and the pork carnitas) and gyros, drank a not-big-enough $2 cup of strawberry lemonade and walked around eating samples of hummus, cheesecake, fruit and honey in the LA sunshine. Although I don't have any evidence in pictures, I ate my share of carnitas and chicken enchiladas on this trip. The food is simple, but always hits the spot unlike the chore and surprise of not knowing what are you going to get when you "Mexican" food in Taipei. And though I found spicy tuna finally in Taipei, I loaded up on the monster Theta Animaniac (a snowball of spicy tuna over fried crispy rice) and rolls from California Roll Factory as well as tried out rolls from Ami's. I wasn't in love with their baby lobster roll (a bit dry and well, isn't it crawfish? ), but the Las Vegas roll was good, though their spicy tuna seems to have an extra dash of Tabasco than I'm used to. Although I had heard about Yogurtland from Elmomonster, it's not the same unless you visit it. 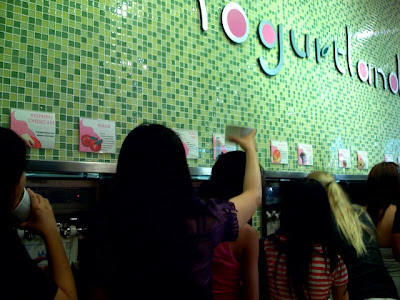 A row of self serve yogurt machines, you can pile on the yogurt and fresh fruit and toppings to your stomach's delight, at the cost of US$0.30 an ounce. You might think the pint sized empty paper cup is too big, but it makes you (or made us) pull the levers until we had about 1 pound of yogurt plus fruit. The picture isn't pretty with melted yogurt of half a dozen flavors and colors, but it tasted good. If I had to go again, I'd get the chocolate mint, blueberry tart and mango flavors. Avoid the artificial tasting peach flavor. It's pretty brillant since the customer gets to do it exactly the way they like it, and maybe you don't feel like $3-4 dollars worth of yogurt, you can just get a taste. But since you don't know how much it actually weighs, you might pay more than you think. I guess the more you go, the better you'd get at doing it. 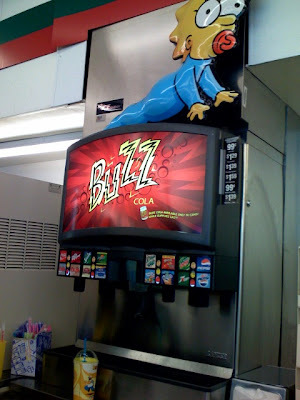 I even got to wander around a Kwik E Mart in Burbank- with offerings like Buzz Cola, Sprinklicious donuts, Squishees and other Simpsons stuff for the tourists and fans. There are only 10 in the world and who knows how long they will be around now that the Simpson's movie is coming out. I had to wait a bit for parking, avoid the kids who were trying to find the Buzz cold that one lucky girl had in line, and avoid the people taking pictures with the signs. 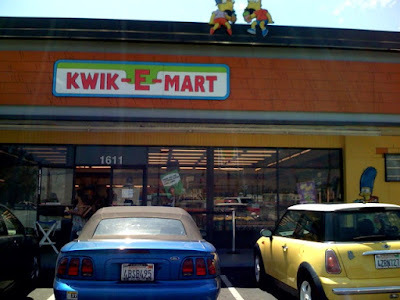 I bet the 7-11 owners wish that it could be permanently a Kwik E Mart since I've never seen a 7-11 so busily trafficked. I almost wish I had picked up some pink frosted Krispy Kremes. Last but not least, the you could go to the Counter and eat a different burger everytime you go, since you can choose your cheese, toppings and bun. On this day, I picked feta cheese, corn salsa, roasted red peppers and onions on an English muffin which is not strong enough to hold everything. So it's back to Taipei and my love hate relationship with the food here. I've heard about a few new places, so hopefully we'll have to time to visit them!